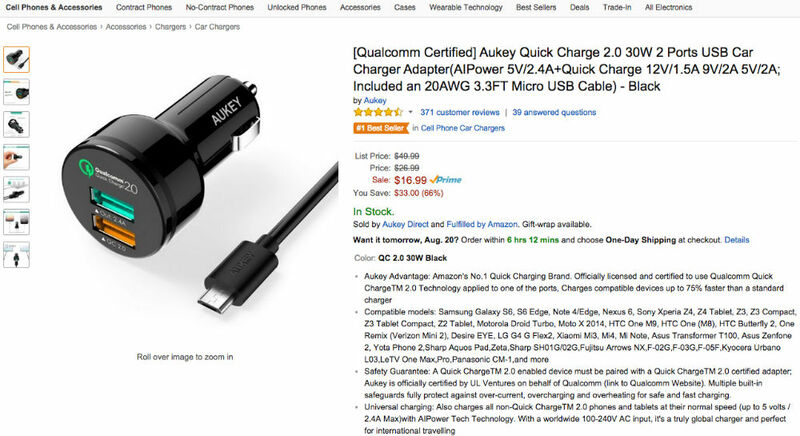 Thanks to a promotional code we have handy, you can pick up an Aukey Qualcomm-certified Quick Charge 2.0 car charger for the price of just $9.49. With a list price of $50, and already heavily discounted, the promotional code takes off an additional $7.50 from the sale price. It’s a steal. The charger features two ports, one for QC 2.0 and the other a more standard voltage, capable of charging two devices, even iOS. Once added to your cart, simply input the promotion code listed below, then you will see your price drop to under $10. For owners with a compatible device, it’s certainly worth the price.